An Absolutely Remarkable Thing is a thrilling journey that takes a hard look at the power of fame and our willingness to separate a person from the brand. Green manages to blend humor, mystery and science fiction in his fast-paced debut novel. With this comic story about the ugly side of Internet fame, Green gives his brother John (The Fault in Our Stars) a run for his money. A quirky millennial mix of sci-fi alien mystery, celebrity and social media commentary. Hank Green, super-vlogger and brother to YA legend John, pens the heart-warmer An Absolutely Remarkable Thing. Packed with meditations on the nature of celebrity, social media, and the cultural response to the unknown. It’s not in the nature of a sci-fi comedy blockbuster to shift boulders in your soul. 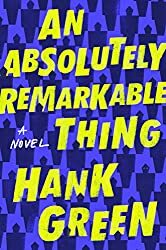 But with his debut novel, An Absolutely Remarkable Thing, Hank Green pulls it off.… There are still a few exceptionally remarkable things that rise above the rest of their absolutely remarkable peers. In the pages of An Absolutely Remarkable Thing, April’s discovery of New York Carl is one of these exceptions; in the real world, Green’s debut deserves to be another." [A] comic debut that combines science fiction and mystery with philosophical musings about the perils of internet fame.… Though the ending is disappointing (it appears to be setting up a sequel), fans… will find his humor and perceptiveness intact in this novel. (Starred review) Led by an earnestly flawed, bisexual heroine with direction and commitment issues, coupled with an abundant generosity of spirit, this read is timely and sorely needed. Highly recommended. (Starred review) Green makes an entertaining book debut in this fast-paced, witty first contact novel…At once funny, exciting, and a tad terrifying, this exploration of aliens and social media culture is bound to have wide appeal to readers interested in either theme. (Starred review) [Green] applies wit, affection, and cultural intelligence to a comic sci-fi novel.… A fun, contemporary adventure that cares about who we are as humans, especially when faced with remarkable events. 1. April May unwittingly finds herself at the center of a media frenzy. Talk about the effect all the attention has on her life. How well does she cope with being an internet sensation? How does she change? Think about yourself: would you want that kind of unanticipated fame; how do you think you would be able to cope? 2. Follow-up to Question 2: How does fame affect a person's sense of themselves: their identity? Hank Green has said that "the act of seeking fame is the act of seeking dehumanization." How does this play out in his novel? Consider, too, the role of the internet and the way it increases fame exponentially—is that a good thing, bad thing …or an absolutely remarkable thing? 3. Follow-up to Question 1 & 2: Why do so people desire fame? What is its attraction? What about you—any desires for fame, or to become a "brand"? 4. How do you respond to the novel's other characters: Andy and Maya, especially, but also Miranda and Robin? 5. Are Peter Petrawicki and his followers realistically drawn? 6. The Carls' motivations are only hinted at, never made explicit. How do you see their motivations? 7. Follow-up to Question 6: What do the Carls tell humanity about itself? How does the author contrast them with who we humans are (or who we think we are)? 8. How do you take The Dream? What do you think it means? 9. The novel's ending: will there be a sequel to An Absolutely Remarkable Thing?